Gadi Rubin, Kullan Sinclair Edberg, Daniel Gonon, Elena Kritter, Conrad Le Bron, and Christine Spang in The Drunken City. Photo by Battalion Theatre. BOTTOM LINE: This comedy mostly lacks substance, but is thoroughly entertaining and charming thanks to spirited performances from the cast. 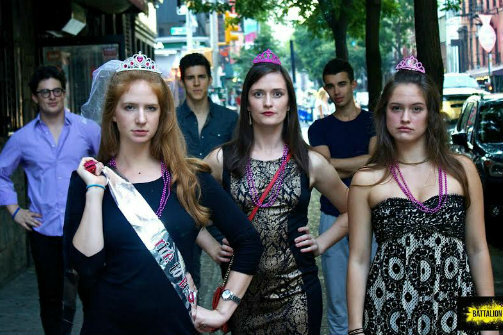 Anyone who has spent any time drinking in lower Manhattan has surely come across the obnoxious, inebriated packs of “bridge and tunnel” women from out of town, teetering down the street in too high heels and too short dresses, often times bedecked in sashes, tiaras, and veils to celebrate the impending marriage of one of the group. Adam Bock’s play The Drunken City, revived in this new production by Batallion Theatre, seeks to give a back story to these women as it focuses on a trio of late-twenty-somethings whose fateful drunken bachelorette party leads to the unraveling of their relationships and the gaining of some clarity. The play opens with Marnie (Kullan Sinclair Edberg), Melissa (Elena Kritter), and Linda (Christine Spang) explaining that they all wound up engaged at the same time. Melissa confesses that she had been so angry that Marnie and Linda got engaged before her that she pressured her boyfriend to propose. Getting married seems to be, for these women, not so much a personal choice as something that they feel obligated to do to belong. In a drunken stupor between bars the trio runs into Frank (Daniel Gonon) and Eddie (Gadi Rubin). Recently dumped, Frank has spent the night trying to meet an attractive woman to soothe his pain. Marnie realizes that she has seen Frank before working at the local bank in her (unnamed) town. Propelled by their inebriation, the girls all flirt with Frank until Marnie winds up kissing him. Furious that Marnie would kiss another man days before her wedding, Melissa pries them apart and slaps Frank in the face. The two run off, looking for a place to make out away from Melissa’s judgmental eyes. Melissa is furious and enlists the help of their boss Bob (Conrad Le Bron) to track the duo down. As Marnie begins to revaluate her life choices, Eddie becomes intrigued by Bob; their verbal repartee shows that each has put up walls to keep them from connecting to others. This simple story is augmented by imaginative sound effects that up the comic value, as well as lighting effects that are evocative of different settings, despite the minimalist set. The script ventures into experimentality when the plot is interrupted by moments where the characters fling themselves across the stage while a strobe light flashes, perhaps symbolizing both how chaos ensues during a night of drunken revelry, and how piecing together events the morning after often includes some confusion and lost time. The cast is also strong in their roles, especially Christine Spang as Linda who manages to show a knack for both comedic and dramatic acting. Any fault in this play lies not with the production, but rather with the script itself, which punctures its superficiality with brief glimpses into the characters’ emotional states, which are mostly poignant, but also, on occasion, laughable. Bock’s decision to not wrap up everything with a happy ending allows this play to transcend the pigeonholes of being labeled a farce or a romantic comedy, but Marnie's conflicted feelings could have been more deeply explored and fleshed out. Overall this story is an engaging and entertaining one, but not one that carries a lot of weight and substance, though it certainly hints at a potential for deeper meaning.